✓ All is set for Amy Perez's debut on Umagang Kay Ganda. The former Good Morning Club host will officially join the UKG barkada beginning tomorrow, December 2. From a reliable ABS-CBN insider, we learned that Perez is rejoining the Kapamilya Network and is almost certain to co-host its morning show Umagang Kay Ganda. Magising nang maaga dahil makikilala na natin bukas ang bagong miyembro ng #UKG barkada! Tumutok na mula 5AM-8AM sa Umagang Kay Ganda! 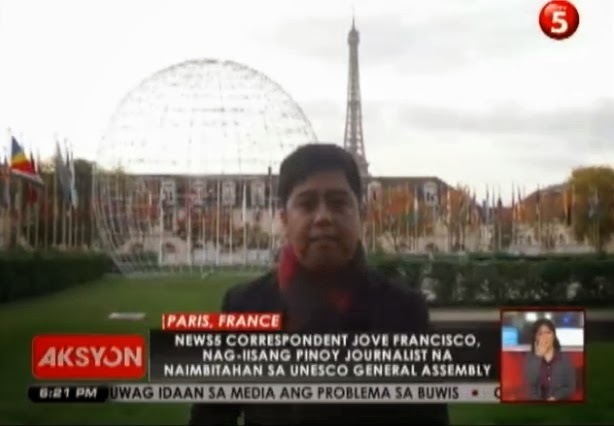 ✓ News5 anchor Jove Francisco marked another milestone to his journalism career as the only Filipino journalist invited by the United Nations Educational, Scientific and Cultural Organization or UNESCO to participate in a forum about Education for Sustainable Development (ESD) in Paris, France. Just last year, Francisco was among the international correspondents invited by the United States Department of State Foreign Press Center (FPC) to cover the AIDS Summit 2012 in Washington D.C.